So the 2018 NOVA Open Invitational is coming up, and there’s a bracket at https://challonge.com/NOVAinvite18 . Predictions based on brackets are always interesting, because they both give you the chance to source a wide range of predictions (there are 110 now) and they let everyone include whatever soft factors they think are important. I’ve never been good at them (though once, by accident, I nearly won an NCAA pool) and beyond that, with as random a game as 40K is, I don’t think the failure of any given bracket actually indicates a failure of that prediction method to work. So instead, I’ve made two what I call “benchmark” brackets – brackets based of randomness that can serve as comparators to people’s actual brackets, if they’re so interested. This is the crudest of all brackets, and is spiritually the same as the randomly selected Fantasy Football team that I never actually submit because it’s against the spirit of the thing. It is literally random – each person has a 50% chance of winning, determined with a random number generator. That’s it. This benchmark uses slightly more information than the random benchmark (in that the latter uses absolutely none), by weighting the coin toss by ITC points. Or, for another physical analogy, think of a raffle – the winner of each game is determined by drawing a ticket from a well-mixed jar, and each player gets as many tickets as they have ITC points. This means that Nick Nanavati (640.11 Points) vs. Reece Robbins (333.24 Points) has a 640.11 / (640.11 + 333.24) = 62.1% chance of coming out in Nick’s favor. 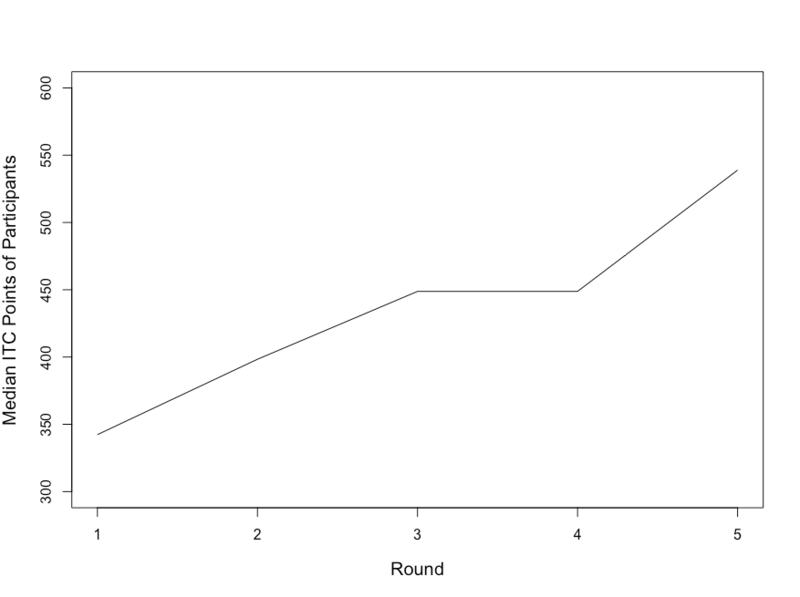 It allows for “upsets” but makes them less likely, and makes a player who sneaks through less likely to continue on, as the average ITC points in each round start to rise. Players without ITC points are assigned the median number of points. Now, this isn’t a perfect metric – there are local groups with very good players who don’t use ITC points. There are distortions around ITC points (doing well in bad group of players is worth more than doing okay in an elite group of players). But it is a simple method, relatively predictive for a number of different tournaments (see 1, 2), and easily accessible to everyone. Over many, many tournaments I’d expect it to do better than the random benchmark, but as noted, a single instance of a very random system is very, very susceptible to oddball outcomes. So who knows. The predicted winner is Sam Lucidi. Again, there are some upsets – my man Adam Abramowicz gets knocked out in the first round despite having an edge in that matchup, and as with the example above, Reece defies the odds and defeats Nick in their game. But those “breakouts” don’t last very long before the weighted success chances catch up with them. So there you have it – two benchmarks, one of them something of a “floor” and one that’s more reasonable, to test yourself against. Look at all those “AM/BA/IK”… are we at peak netlist? I picked Reece to win it all, not that I believe that will happen. I’m hoping he can (through his play) show me how to be a much better marine player. Previous Post: Are Small Countries at a Disadvantage in the ETC?